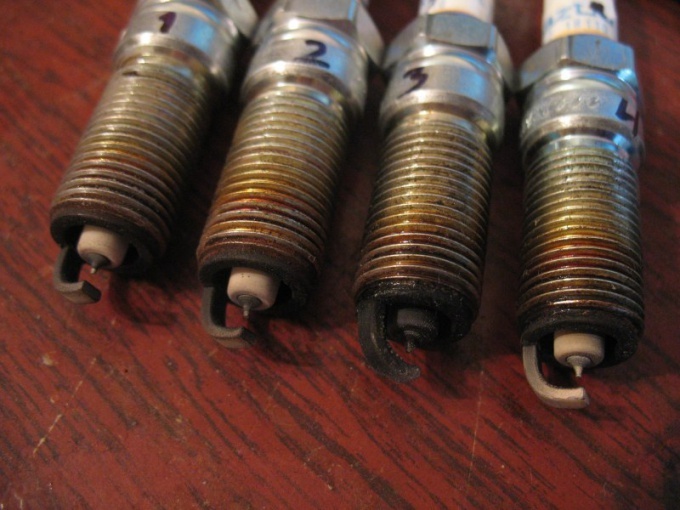 One of the most effective methods of diagnostics of motor – the appearance definition of spark plugs. The color of the conical ceramic insulator is an accurate indicator of each cylinder. At occurrence of deviations in the composition of the fuel mixture spark ignition respond quickly to this change in the color of the insulator of the Central electrode. Because of the poor operation of the engine the color of a candle can change in a few seconds. To conduct this test, make a test drive within 15 minutes. Thus manual release of the damper is not in use. After a trip out the candles and laid out accordingly to those cylinders where they worked. Black soot on the plugs indicates variations in the composition of the fuel-air mixture.Causes of Nagar plugged muffler, after ignition, rich fuel mixture. When data fault engine all candles have the same black appearance.If blackening of one candle of the four may be detected as a malfunction in the corresponding cylinder, and malfunction most of the candles, her high-voltage wire or the tip. For a more accurate identification of the causes are reversed black and clean any of the candles and once again make 15-minute test ride. If the result of the black candle was cleansed, and pure black, it means a malfunction has occurred in the cylinder, which blackened the candles. If the black candle is black and pure, it speaks about malfunction of a black candle.Instead of reshuffling of candles sometimes completely change a set of plugs on a known good. If the results of a control trip on a new set of candles would be similar, fault should be sought in the cylinder. If the second set after the match was completely clean, faulty black candle from the first set.In addition, malfunction of the spark makes itself felt jerks while driving. Means a lot and especially the blackening of the insulator on the plugs. When unilateral blackening when one side of the insulator is black and the other light, the cause of the phenomenon may be unpressurized landing of one of the valves, burnt valve, stuck valve stem in the guide bushing, improper installation of the timing belt, a violation of the throughput of the exhaust system.If the cone of the insulator was black, and the tip of the insulator and the metal electrodes remained clean, this means a mismatch of candles glow at the number for a given engine. It should be replaced by more hot on this number. Conversely, dazzling white candle means that it is too hot for nitro number for that motor.